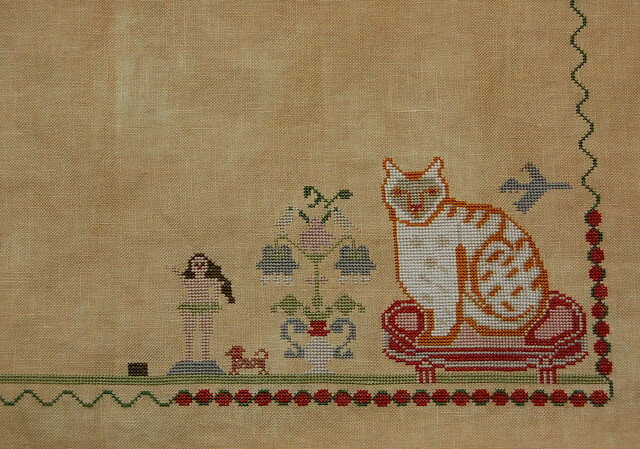 I finished the orange kitty and Eve on Charlotte Clayton. I'm really loving this one! It's such a fun stitch. 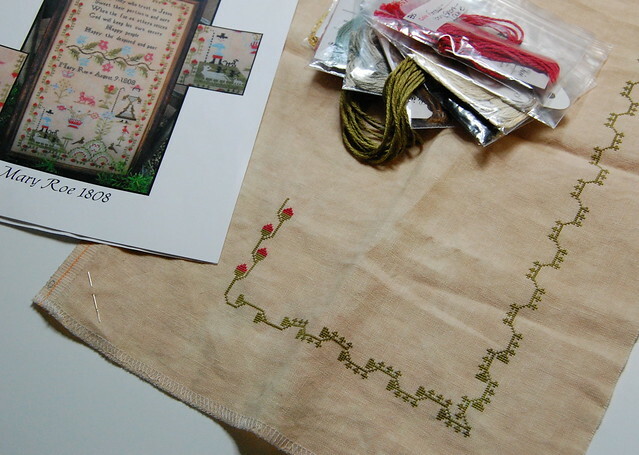 I started The Scarlett House's "Mary Roe 1808" back in March, but didn't put it on my blog because I only had a little bit of the border stitched. I decided to get it back out and work on it some more. I love the colors in this sampler, they're so bright and pretty!! I hope you all had a great weekend! I'll be finishing up packing this week. I really don't have too much more to do. Just a few dishes and then our linens and clothes. Hope you're feeling better, Nicole. Love seeing your WIPs. They're all looking great! Bummer about the two pinks in Dorothy. It looks good whatever pink you chose. I hope you'll be feeling better soon Nicole. All your WIPs look wonderful. I think the NPI pink works well for the border flowers. I really like all the samplers you are working on.I like the colors in Mary Rowe too. I hope you feel better soon I'm just getting over a cold. Not fun. I love the eyelets in Dorothy. And I think the two pinks you chose look nice. It's going to be so pretty! Feel better. I love all your WIPs! I can't wait to watch them grow. I think the pink looks good too. Feel better, Nicole!! If you stitch that well while sick - I'm impressed. Gorgeous cat!! Lovely stitching. I hope you feel better soon. Pretty samplers!!!! Hope you are feeling much better :-). I hope that you're feeling Nicole. You know I have to tell you that I "hate" coming to your blog. Every time I do I see something that I just have to stitch. Dang - you're such an enabler. I wasn't all that into Charlotte, but now I think that I have to do her.....and Dorthy....and Mary!!! I love looking at all the things you're working on! I agree with Deb; you're the queen of enabling, and we love you for it. ALL of your stitching is beautiful !! I'm still stitching away on Mary and loving every minute!! Feel better soon Nicole! Love all that you are working on! Safe travels! I loved seeing your wip's. You sure made some good progress on all of them and while you were not feeling chipper. Fancy a cup of tea? Feel better soon. sorry to read you are under the weather. Beautiful stitching. Hope you feel better soon! No fun being sick when you have to move of all things! As the kids get older you'll get fewer colds, something to look forward to with aging! Hope the hurricanes are not an issue for you. I love all of the wip's but the kitty is wonderful. Feel better. Beautiful stitching. I love the bright colors as well. Hope you feel better soon. Sorry to hear you caught a cold, but I always try to take advantage of that 'down' time to work on cross stitch as well. It helps that DH is especially helpful with the child, so I rarely have to do the stand-up-sit-down routine very often! Your samplers look lovely - hope you feel better! Hope you're feeling better :) Love the projects you're working on! Your Wips are lovely, that cat is just great. Hope your cold feels better soon. i love your blog and your beautiful works!!! I hope that you are feeling better Nicole! Ah-so you were 'sick' and stayed on the couch stitching... UmHuuu! Well, you got some pretty stitches in, now didn't you? Just teasin'. Be well and feel better soon! I hope you're feeling better from the cold. Your WIPs are all lovely. Very nice WIPs! I hope you'll be better soon. Lovely WIP's! Hope you're feeling better soon. 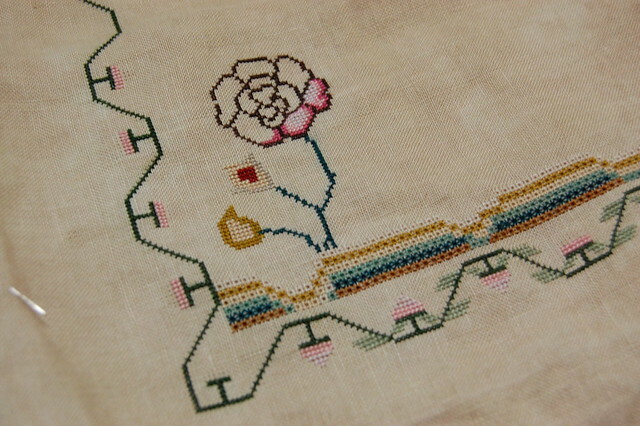 What pretty stitches! I do hope you are feeling better! Hope you're feeling better. All your wips are looking lovely. I'm sorry about your cold, Nicole. I love that cat! Very pretty! Your WIPs are all lovely! Your Dorothy looks great. I hope you'll enjoy her as much as I enjoyed stitching her! Good luck with your move! I hope everything goes well for you and your family! Do hope your feeling better, I have Charlotte to do in my pile, I will watch your progress eagerly. Your WIPs are so nice, Nicole. Coming to your blog is like indulging in a bit of crack for me--I want to start all of the samplers you're working on, too!